Home Dermatology Psoriasis What Is Psoriasis And What Causes Psoriasis? What Is Psoriasis And What Causes Psoriasis? Psoriasis is a common, long-term, slow progressing skin condition that affects up to one and a half million people in the UK. Psoriasis makes the skin of a person inflamed (becoming red, swollen and painful) and can make it look like fish scales (scaling). Psoriasis can affect any part of the body. There are a number of different types of psoriasis and they are explained in the section 'Will I have any tests or investigations?'. The cause of psoriasis is unknown. But certain types of the condition might be inherited: about three in ten people with psoriasis have a relative who also has the condition. However, a definite genetic link has yet to be proved. It is thought that the underlying problem is that new skin cells are produced too quickly and rise to the surface before the old skin cells have had time to die off and be scrubbed away. The result of this overproduction of skin cells is red and raised patches on the skin. The overproduction of skin cells may be due to a problem with the immune system. In psoriasis sufferers, their bodies' immune systems may cause too many white blood cells (known as T cells) to be produced in the skin. These T cells cause the skin to become inflamed by releasing chemicals that cause the body to react as if it was being attacked by an infection - this is known as the inflammatory cycle. This inflammatory cycle causes the excess production of skin cells and this produces psoriasis. On the skin, psoriasis appears as patches of thick, red skin that have a silvery scaly appearance. These skin patches are known as plaques. The plaques usually appear on the elbows, knees, scalp (skin under the hair of the head) and on the lower back. However, plaques can appear on any part of the body. Plaques may itch intensely, or 'burn' and the skin may crack around the joints (such as the elbow or knuckles). No matter which type of psoriasis a person has, they will find that their nails become thickened, crumbly and pitted. Psoriasis tends to appear and disappear and there may be wide differences in its severity on the same person over time. Most sufferers only have a few isolated patches but, in its worst form, the psoriasis may affect the whole body and 6 people with psoriasis in every 100 develop a form of arthritis in the joints. This rare form of arthritis usually occurs at the tips of the fingers, in the toes and in the lower back of those who develop it. And, just like the skin plaques, this form of arthritis can disappear completely. Most forms of psoriasis can be diagnosed by a doctor carrying out an examination and asking the sufferer a number of questions (known as ftaking the history'). But diagnosing psoriasis can sometimes be tricky as psoriasis can look like other skin conditions so, if there is any doubt in the doctor's mind, a small sample of skin is taken and sent to a specialist for confirmation. ¤ Guttate psoriasis. This form of psoriasis often appears several days after infection by a virus or a certain type of bacteria known as streptococcus. It looks like drop-like patches on the torso, scalp or limbs and is often milder than plaque psoriasis. ¤ Pustular psoriasis. With this form of psoriasis, painful bumps of pus (known as pustules) or blisters appear on the palms of the hand or soles of the feet. These pustules and blisters then turn brown and scaly. It is common in middle age and more painful than plaque psoriasis although not usually more severe. ¤ Flexural psoriasis. The skin is red but not scaly. Flexural psoriasis appear in the armpits, groin or under the breasts, and is often as severe as plaque psoriasis. ¤ Erythrodermic psoriasis. A rare condition where much of the body's skin has become red and scaly. The body's ability to control its temperature and fluid balance have been badly affected. People with this erythrodermic psoriasis often need to be treated in hospital. 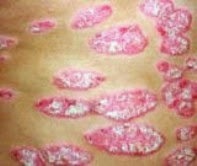 What Psoriasis Treatments Might I Need? Doctors normally follow the '1-2-3' treatment system for psoriasis. Step 1. Using treatments that are applied directly to the skin in the affected area. Such localised treatment of a condition is known as topical treatment. Topical treatments for psoriasis include skin softeners (known as emollients), coal tar and salicylic acid preparations, steroids applied to the skin (if used carefully), Vitamin D ointments and dithranol - a synthetic chemical used effectively in plaque psoriasis. Your doctor will probably try a number of different treatments as not every treatment works for every patient, so that he or she can find the one that suits you best. Step 2. Treating the condition with light (known as phototherapy). The majority of sufferers benefit from sunlight, and this type of treatment developed from this observation. It is called PUVA treatment, where the patient takes a drug called psoralens before being exposed to ultraviolet A light in a solarium 'box' for half an hour two to three times a week. This is effective, especially in the more severe types of psoriasis. Step 3. Treating with oral tablets. The usual one given is called methotrexate, which works by slowing down the excessive production of the skin cells and so reducing the psoriasis. This can be dramatically effective, but these drugs are generally avoided unless all else has failed and your psoriasis is severe, because of the potential side-effects of the drugs such as severe nausea, vomiting and toxic effects on red and white blood cells. Any treatment with such drugs requires regular blood tests to monitor the body's reaction to it. Psoriasis follows a fluctuating pattern, so many people will need little or no treatment for a while and then more active therapy as the condition becomes worse, before the condition gets better again and so on. Each person's psoriasis is different and will respond differently to different types of treatment, so often trials of treatment are needed. At least one third of people with psoriasis will find that their problem disappears for long periods of time or, for some people, for ever. However, a permanent cure for all people has not been found yet. Definitely. There are at least three easy steps you can take. Stress. Stress makes psoriasis worse, so one of the most beneficial things you can do is to try to develop a positive attitude to the condition. Diet. Although no specific diet has been shown to be of benefit, if you find your psoriasis seems to be worse after eating certain foods, avoid them and see what happens. Sunlight. Moderate sunlight helps many people, although a small number find that their psoriasis worsens after exposure to the sun. 1. Does anyone else in the family have this problem? 2. Have you noticed any problems with your joints? 3. Is it worse when you are stressed? 4. Does your skin seem to be flaking off more than usual? 5. Are the patches very itchy? 2. Can it be linked to my hormones? 3. Can my children inherit it? 4. Should I shower or bathe, or does it make no difference? 5. Are there any alternative treatments which may help my skin? By Dr Roger Henderson, MB BS Lond., LMSSA Lond., Published by Dr Vivienne Balonwu, MB BCh BAO, LRCP&SI.